Every offspring who is showed has received gold, and several of them competing in dressage or show jumping in high class. One of them Arhults Waldemar is showed many times and has everytime received gold. 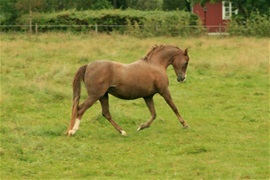 Now he is in our Qualitybook and is using as a breeding stallion. Rosies sire Cwerty Cadno Cadfridog has been Supream Champion at RW His Dam Talhaearn Eirlys Y Pasg has been female Champion at RW. Rosies Mother goes back to the ground of Weston stud.